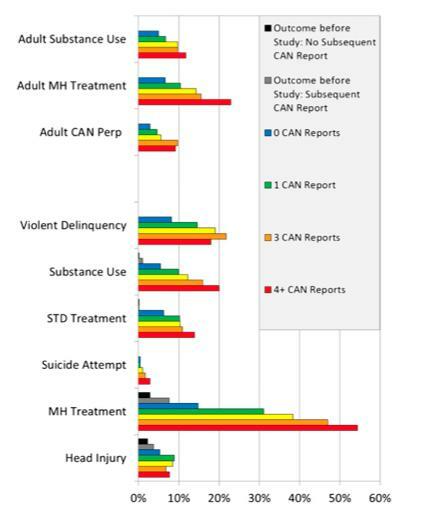 Chronic child abuse and/or neglect (CAN) suffered by children leads to increased risk in all categories above. In cases of violent delinquency, brain injury, and further child abuse by parents who were abused as children, there’s a slight decline for the highest category compared with middle categories. But in all cases having reports was associated with higher rates of problems. The researchers followed 5,994 low-income children from St. Louis, including 3,521 with reports of child abuse and/or neglect from 1993 through 2009. The children were one-and-a-half to 11 years old at the beginning of the study. The researchers also had access to the children’s records of substance abuse and mental health treatment, brain injury, sexually transmitted disease, suicide attempts and violent delinquency before age 18, and, when they were adults, records of mental health treatment, substance abuse and abusing their own children. One way is to screen parents for ACEs, which the public health department in Port Townsend, WA, is doing, and then providing extra parenting support to those with high ACE scores. Another way is to make the Nurse-Family Partnership program available to all parents, no matter what their income or circumstances. DELTA’s project coordinator, Lesley A. Coghill, who works at the Center for Women in Transition, must be a great presenter, or the community’s decided there’s a huge need for this information. Perhaps a little of both? DELTA is a federal program operated through the Lakeshore Alliance Against Domestic and Sexual Violence. DELTA operates in 14 states and is coordinated by the CDC, which provides more information on the DELTA site. According to the site, this program is the first time some states have developed programs to prevent family violence. All of their previous efforts had been focused on dealing with the aftermath of family violence. The CDC plans to rely on the experiences in these 14 states to develop best practices on how to successfully prevent family violence. A CONTRIBUTOR TO FORBES.COM did this intriguing post: “How Some Men Are Upending Domestic Violence Laws to Scam an Advantage in Divorce“. Jeff Landers, founder of Bedrock Divorce Advisors, which provides financial analyses and projections for women going through financially complicated divorces, says husbands do this in two ways: They claim their wives are abusers, and they use coerced debt (opening credit cards in their spouse’s name, hiding marital assets, and tricking their spouse into signing financial documents) that leave the wife with a bad credit rating and/or piles of debt. The set-up: A couple has a fight. Either the wife calls 9-1-1 in a desperate plea for police intervention, or the husband makes the call first in a preemptive attack. When the police arrive, the woman is visibly upset. The man, on the other hand, is extremely calm as he switches off his anger. The husband tells the police that his wife is delusional, crazy, and violent. Depending on how convincing the man’s story is to the police officer, and the state’s law on domestic violence, either both people are arrested or the woman is arrested.